Valentine's Day Weekend -- Sunday is the 14th. So, what romantic movies are on Friday night? And there's technical issues. The Apollo moved the wrong way when the hatch blew. Why are they hearing the beeping representing the Soyuz? And where are its solar panels? The X-RV cockpit, and especially that absurd canopy hatch, were clearly Hollywood. Some technical issues were done to minimize confusion, but to someone who knows, they seem to have conjoined the launch and mission controls, though they used both sets. And goodness knows, the jargon of the launch procedures was there. In 1991, Marooned was redistributed under the name Space Travelers by Film Ventures International, an ultra-low-budget production company that prepared quickie television and video releases of films that were in the public domain or could be purchased inexpensively. 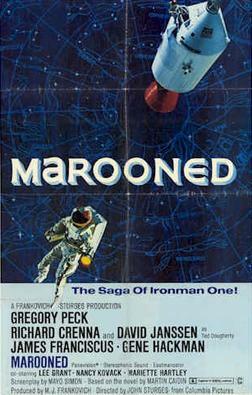 As Space Travelers, Marooned was mocked on a 1992 episode of Mystery Science Theater 3000, becoming the only Academy Award winning film ever to receive the MST3K treatment. Yeah the cut version is incomprehensible.